Find small (benchtop) autoclaves and dry sterilizers here. 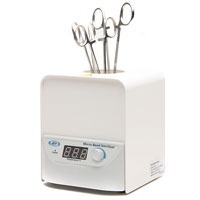 These are perfect for sterilizing small batches of surgical instruments in a research laboratory. Benchtop Autoclave, 16 Liter, Tray dimensions 16.5 x 27 cm (6.5x10.75"